Commod Pro propagates any kind of coherent beam. The beam propagation, based on Fourier transform method, takes into account diffraction, spatial and temporal dispersion and shift, and Kerr effect. Commod Pro can propagate ultra-short pulses considering streching and compressing effects. Commod Pro manages 4 level solid state amplifiers with rod and slab geometries; gradient refractive index is also taken into account. Gain profile and thermal and mechanical effects are simulated by Spir and Thermopt respectively. Frantz and Nodvik model is used for amplification and gain saturation. This is a very important feature of Commod Pro. Virtual components allow you to develop your own transfer function to simulate either new components or physical beam interactions and to implement them in Commod Pro. You will take advantage of Commod Pro capabilities and you will bring your own expertise in it. At the initial stage you create your virtual component and can insert it in the optical chain using Commod Pro system building interface. During the calculation the interaction between Commod Pro and your virtual component will be carry on througth output Commod Pro files exchange. Export all results (spatial, temporal and gain profiles) as ASCII files for later data processing. Other formats are available. 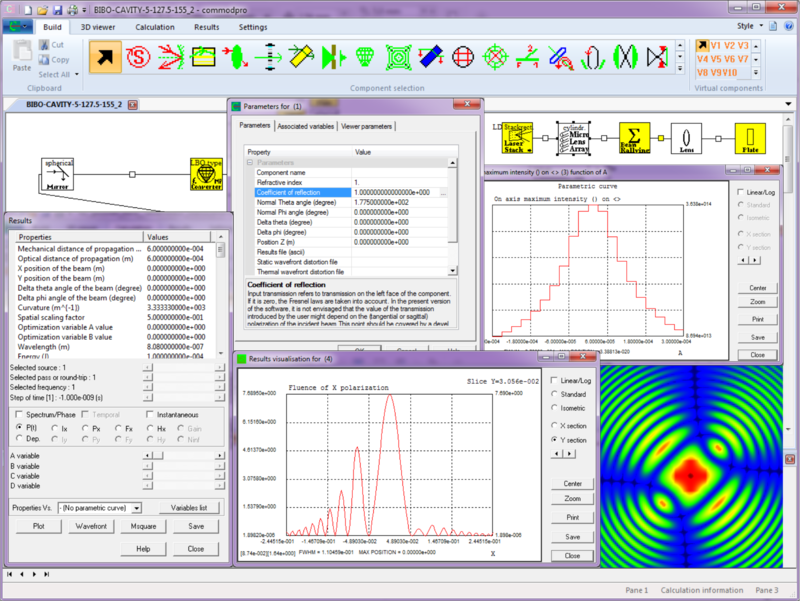 Commod Pro uses a very intuitive and exhaustive graphical user interface that allows to build optical systems very easely and get outputs all along the optical chain. Example of beam amplification through a zigzag slab pumped by laser diodes. Example of beam temporal profile after amplification. Interested in Commod Pro ? © 2019 OXALIS-LASER, SARL. All rights reserved.